Susan Louise Souza, 71 of Wailuku, passed away on October 14, 2018 at her residence. She was born on September 9, 1947 in Wailuku. Visitation 9 a.m. to 11 a.m. on Thursday, November 1, 2018 at Ballard Family Mortuary, service 11 a.m., burial 12:30 p.m. at Maui Memorial Park. Dad enjoyed hunting, throwing net, music, singing and of course Las Vegas! Dad was a very kind, jolly and social man; he loved making people smile, laugh, sing and was quite the jokester. Dad was all about family, love and kindness. He is pre-deceased by the love of his life of 67 years Alfonsa; brothers Big Joe, Little Joe, George, Louie, Alton; Sisters, Helen, Olivia, Kathryn, Violet, Margie and Landa. He is survived by sons, Alfred (Valentina), Edward, Michael (Brenda), Darren (Heathre) and daughter Lori (Derrick) Arruda; daughter in-laws, Genoa, Tamashi, and Hyon Sun; sister Alice (Kimo) Martin; 16 grandchildren, 48 great grandchildren and 2 great, great grandchildren. Mahalo to Dr. John and Val Janikowski, Straub Clinic Lana’i, Lana’i Community Hospital ED, AMR, Lana’i Fire station, staff of (former) Keola Hou O’ Lana’i and Lana’i Hospice. Dad called you all his angels. Thank you to all that touched our dad’s life and heart. 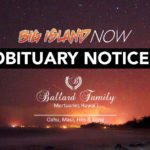 Visitation will be held at Sacred Hearts Church, Lana’i on Saturday November 03, 2018 from 9:00am-10:00am. Mass will be celebrated at 10:00am with burial to follow at the Lana’i Cemetery.Mom and Dad dancing and singing together again in the Heavens. Beatrice “Aunty Bea” Leialoha Fernandez, 88 of Kahului, passed away on October 7, 2018 at Hale Makua Kahului surrounded by her family. She was born on September 27, 1930 in Paia, Maui. Visitation 9 a.m. to 10 a.m. on Friday, October 26, 2018 at Ballard Family Mortuary, service 10 a.m., burial 1 p.m. at Maui Veterans Cemetery. Beatrice retired from Maui Pine where she worked as a Label Machine Operator. She is survived by her son, Jason (Jill) Fernandez; grandchildren, Blaize, Ryden, Kaela, Kahau, Tehani, Kalena; brothers, Peter, Jerry, and Raymond Kaiama; sister, Agnes Fernandez; nieces and nephews.